Paul Thistle and Kevin McNab had finished within a handful of seconds of each other before on this four-mile run down Wilson Boulevard starting in Arlington’s Courthouse neighborhood. But unlike the last time, Thistle was able to come out on top at Saturday’s rain-soaked Four Courts Four Miler. The 27-year-old crossed the tape in 20:11, better than second place McNab’s 20:41. “He was just a better man than me today,” said McNab, 28, of Washington. [button-red url=” http://www.zippyraceresults.com/search.php?ID=4700″ target=”_self” position=”left”] Results [/button-red]McNab, who runs for Georgetown Running Club, finished first in 20:05, a slightly better time than Saturday’s winning finish, and Thistle third in last June’s Freedom Four Miler on the same course. Both races stretch from Courthouse downhill to Rosslyn before going south on Washington Boulevard. At the two-mile mark, there’s a hairpin turn before coming back on the same path, which is entirely uphill this time. McNab was hoping Thistle would slow down on the Hill, but that didn’t happen. Otto Kingstedt, 20 was the third overall male at 21:25. McNab hopes to break 50 minutes during a 10-mile race later this year. Thistle has his sights set on this summer’s track season. Woman’s winner Amy Laskowske, who, like Thistle runs for Pacers-New Balance, finished second in the Four Courts Four Miler last year, but was able to come out on top Saturday in a time of 22:44 with last year’s winner not around. The 27-year-old is still getting back into competitive racing following a four-year break after a successful track and cross country career at the University of Minnesota. She was an All-American in the 10,000 meters on the track in 2009 for the Gophers. The cool, drizzly weather didn’t bother the Arlington resident, saying it keeps her cool. With temperatures in the mid-40s at the 9 a.m. start, there was a light to moderate rain throughout the morning. Laskowske finished just under a minute ahead of second place woman Lindsay O’Brian of the Georgetown Running Club, who clocked a 23:37. The course’s hill made for what she called an “unusual course,” she said. “It’s definitely not a PR course,” O’Brian said. “It’s good for a solid race and a workout,” which is exactly what the 29-year-old used it for. She hadn’t raced since early December and wanted to kick the rust off her racing flats before tackling next month’s Cherry Blossom Ten Mile. Emily Potter of Alexandria finished as the third woman in 24:25. 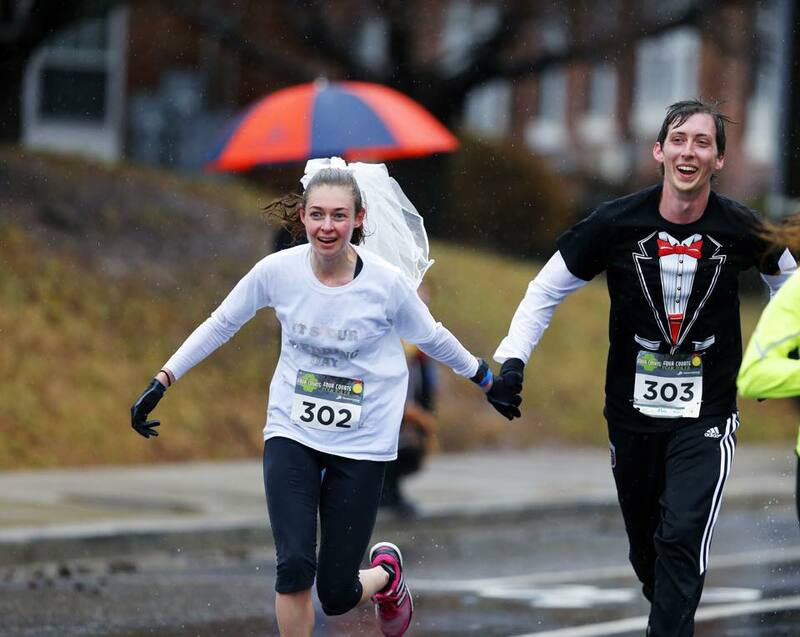 Laskowske and McNab each won last month’s Love the Run You’re With 5k. The weather somewhat soured turnout. A bit more than 1,100 runners crossed the finish line of the race that was capped at 1,750 and nearly sold out beforehand. A bit more than 1,500 ran last year’s race. But the rain didn’t stop the 1,100 runners from donning their green on the St. Patrick’s Day weekend road race. Reeves dressed as a leprechaun for the race, complete with a green tailcoat jacket, top hat and long, and red beard, to call runners to the start line, goose late arrivers, take pictures with finishers after the race, and do other race-director duties. Bag pipes played a runners set off on the course, and finishers were given a pint on the house at Ireland’s Four Courts afterward. Mike Howie, 34, sported a green “I heart beer” t-shirt with a full beer stein replacing the heart. His wife had signed up for the race but stayed home with their kids because of the cold rain. “It was a little colder than I was expecting,” Howie said. The Alexandria resident has never ran a St. Patrick’s themed race but decided to enter when his wife recently took up running. Jeremy Lynch, 34, took the unofficial title of baby stroller-pushing champion, finishing in 26:08 with his 18-month-old daughter. The weather didn’t stop his family, having survived St. Pat’s 10k two weeks prior. That race was nearly canceled because of sleet and icy conditions. “That one was a little bit worse than this one,” Lynch of Springfield said. “I figured she’d tough it out. She’s usually pretty good in a stroller,” he said referring to his daughter. Gigi Good, 26, wore a big, green felt leprechaun hat while drinking her post-race beer. “We would have worn them if it wasn’t raining,” Good, who ran the race with four of her college friends, said. Dave Cahill, Ireland native and general manager of Ireland Four Courts, which sponsors the race and post-race party, started 10 minutes after the starting horn sounded. For every person he passed, Pacers will donate one dollar to the Arlington County Police Benevolent Foundation, a nonprofit that helps families of police officers injured or killed in the line of duty and other officers in other ways. The effort gives between $1,000 and $1,200 to the cause each year, although he only passed about 850 Saturday because of the lower turnout. Saturday was the third year Cahill has undertaken the effort. Cahill, 43, the top runner of his age group in the Washington area last year, finished in 24:38, the 15th fastest person overall if not for this 10-minute delayed start. He even makes friendly wagers with customers, who often run the race, beforehand.